About 80 families have been living under a tent in a car park after their flats were declared unsafe to live in. Photo: Stacy Liu. Housing is a major worry these days. Many Malaysians, particularly the younger generation, struggle to find a good place to live, particularly with rising house prices and an increased cost of living. People gripe about finding a suitable place in a suitable location, to say nothing of how to pay for it. A large group of families in Putrajaya, however, face more serious housing woes than most. They were relocated from their estates 14 years ago, with a promise of being moved to terrace houses. They are still waiting to this day. The families were moved to low-cost flats in Taman Permata, Dengkil, which they were told was a temporary measure. This was in 1999. Over one decade later, despite protests, petitions and promises by politicians, they are still there. To make matters worse, a recent accident at one of the blocks has forced about 80 of those families out of their flats, causing them to live in a makeshift tent for over a month now. Before researching this story, my only knowledge of the Dengkil Flats came from reading occasional newspaper reports. 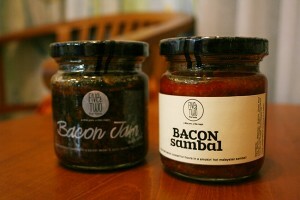 Like most KL-ites, I didn’t know much. It was with the lowest of expectations, therefore, that a photographer and I drove down to Dengkil, eager to look into the situation for ourselves. What I found completely surprised me. I envisioned a community in despair, an embittered people whose experiences in squalor had pushed them towards cynicism and loathing. What I found, however, was a scene of solidarity, optimism and determination, even in the face of impossible odds and unfulfilled promises. Taman Permata is located in a quiet part of Dengkil. The place is about fifteen minutes drive from Salak Tinggi, which is a hub of industry now that some of its land was recently acquired by a private company. The area is rife with upcoming development, including a university, premium outlets, and even new townships that are slated to launch in the first quarter of 2014. In Taman Permata, however, the pace of life moves slower. We find the flats with the help of the GPS and banners hung up along the roads, with messages such as ‘’PM DON’T WAIT UNTIL WE DIE!” and ‘’WE ARE NOT FOREIGNES” (sic). After parking our car, we make our way towards a large tent erected in one of the carparks. There are a number of people inside, most aged in their fifties and above. Representatives from local NGOs are also present and speaking to some of them. A large whiteboard stands in one corner of the tent, proclaiming ’PERJUANGAN: HARI 41’ (‘41st day of our battle’). There is a large wooden platform standing in another corner, next to a stack of mattresses on some chairs. Women sit doing chores next to basket of cooking oil and other groceries. There is a whole world here beneath this tent. One of the residents prepares a meal on a small makeshift platform between the tents and a nearby drain. Photo: Stacy Liu. I asked those under the tent to tell me their stories, and they were happy to oblige. 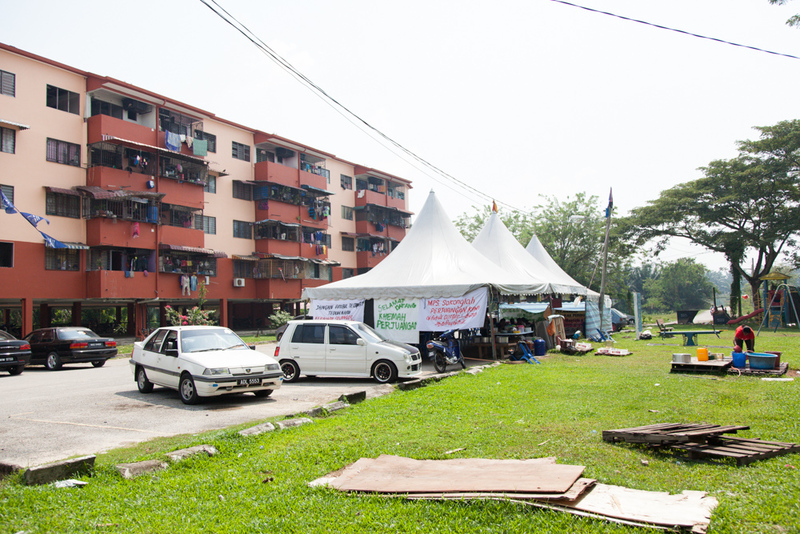 In 1999, around 400 families from four estates (Prang Besar, Sedgeley, Medengley and Galloway) were moved to these flats in Taman Permata after their estates were acquired for the development of Putrajaya. While the lands were fully acquired by the Putrajaya Federal Government, parts of it were apportioned to Cyberjaya, and are now under the Selangor state government. “It was sometimes difficult on the estates, but our hearts were always light,” said former Prang Besar estate worker K. Ramadass, 52, who now works in a factory. Ramadass said the federal government had given them notice of the land acquisition in 1995. “They said they would give us terrace houses, and then gave us these flats to live in. They told us it was only temporary. 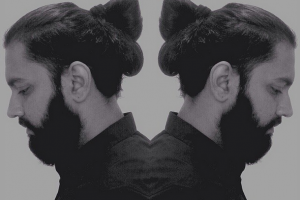 The whole thing was done through word of mouth, nothing was in black in white. In those days, it was how things were done,” Ramadass said. Former estate worker T. Thanapakian, 60, claimed they had been intimidated into giving up their estates. He now works as a cleaner in a private college. Asked about the flats, the residents are unanimous in their displeasure. I listen to stories of shaky conditions, of unsteady foundations and wall decay. “We live in fear. There are a lot of cracks in the building. And a lot of the residents here are elderly, so we all worried something could happen to them.” Ramadass said. “Every time it rains, the place floods. It is very difficult to stay here,” said former Segdeley estate worker C.K. Mathavi, 65, who used to live in the Taman Permata flats with her grandchildren. She added they had sent memorandums to the government several times on this matter, and had participated in a 24-hour protest where they had slept at the side of the road by their houses. However, this had all been to no avail. I am later referred to the Secretary of the Taman Permata Dengkil Residents Association, N. Kumaran, who elaborated on the situation. “On 10 Sep 2012, the federal government presented a check for RM2.5mil, which they said was for the maintenance here,” Kumaran said. Ramadass then made reference to a runway for remote controlled airplanes and helicopters located in Putrajaya. “How come you have space for that, but not for people? For remote controlled airplanes, you can give land. But for us, us 400 families, you can’t,” Ramadass said. Various cracks are clearly visible on the walls and ceilings of the flats. Photo: Stacy Liu. The Taman Permata residents said they were going about their daily business on 11 June 2013, when they suddenly heard a loud explosion from the bottom of the Block E flats between 5pm and 6pm. Curious, they went to investigate, and noticed a giant crack had formed above one of the supporting pillars. The flats were then quickly evacuated. According to Mathavi, various bodies such as JKR, IKRAM, the Sepang Municipal Council, the police and firemen arrived to check out the situation. “An official came to check things out. He declared that the block was safe, and we could go back inside. All he did was look around! When he asked him to give us a letter declaring the place was safe, he did not. He did not sign one,” she said. Worried about the situation, the residents of Block E started to live in the tents by the carpark. Mathavi said they slept on mattresses, with the men and the women separated. “It’s very difficult at night, especially with the wind and the rain. There are a lot of mosquitoes at night,” she said. “Sicknesses like fever are easy to spread. And the nearby pollution also makes it worse,” Thanapakian said. Mathavi added that her grandchildren had to take baths at school. She said the adults went back to their flats to shower, although they tried not to stay in there for too long due to fear. “We eat here. The resident association AJKs and NGOs buy us food,” Mathavi said. An emotional Thanapakian said a local politician from the MIC had recently come to survey matters. “He looked at the situation, and told us not to worry. All he did was look around! This made us very angry. What are you doing here? We have been telling you about this problem for years, and you have done nothing! All you do is just ‘make-up’! Have you no respect for human life?” she said. 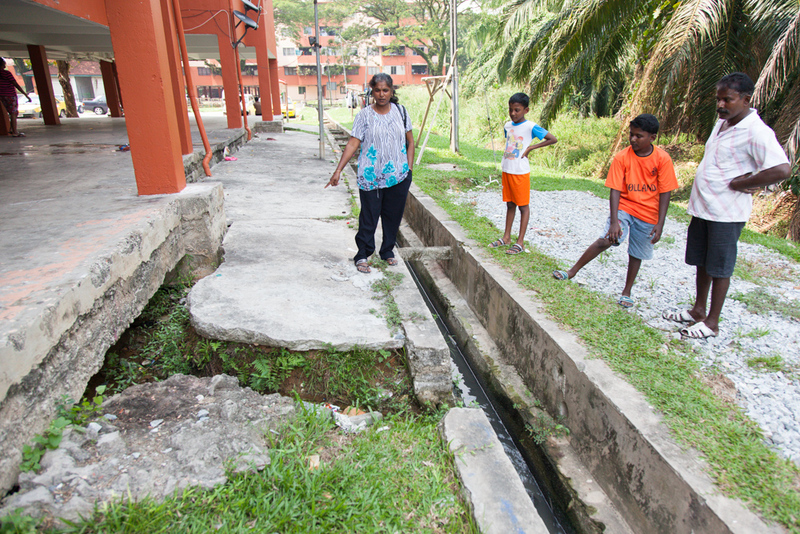 Residents claim the land where their flats are built on have been gradually sinking over the years. Photo: Stacy Liu. We are then taken for a small tour of the flats. As I am taken around, I am greeted by many of the flat residents. I shake hands with a middle-aged man and his son, who eagerly get up from their television watching to show me their humble flat. They are cheerful, even as they point various cracks in their walls. Manoharan even takes me to see the fateful crack which caused the eviction. He points out two secondary pillars which the local council erected as a makeshift solution to the problem. “They are supposed to support the pillar,” Manoharan said. “Instead, they are really supporting the whole building.” He added no follow-up work had been done after the pillars were erected. He also takes me to view the building’s foundation, which is slightly visible through a fissure outside the building. I peer through and note it is full of water. He added the stagnant waters also gave rise to mosquito breeding problems. 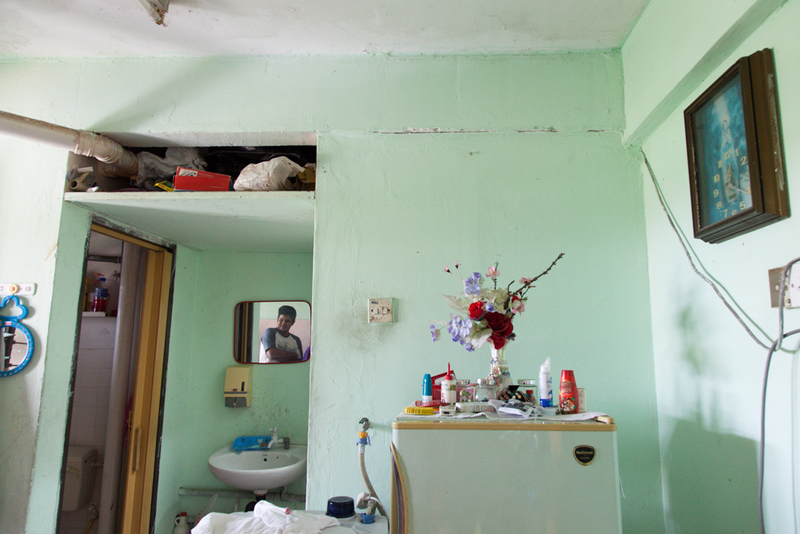 Inside the flats of one of the residents, which suffer from cracks and fissures on the walls. Photo: Stacy Liu. Kumaran said that in November 2011, then-state executive councillor Xavier Jayakumar had come to Dengkil with letters from the land office. “He told us we had a lot of 18 acres confirmed for us, together with another nine acres on standby,” Kumaran said. However, he later learned that the federal government was responsible for building houses on the land. He added however, that on 15 July 2013, state executive councillor V. Ganabatirau had called a press conference announcing that they had allocated them 30 acres of land. When contacted by phone, Urban Wellbeing, Housing and Local Government Minister Abdul Rahman Dahlan said his ministry was working hard on the situation, which was a frequent discussion topic in Cabinet meetings. The minister slammed several reports on the issue by a few media portals, saying they were inaccurate and biased. 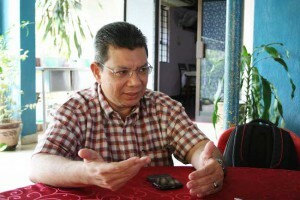 He also accused the Selangor state government of “politicising” the issue. 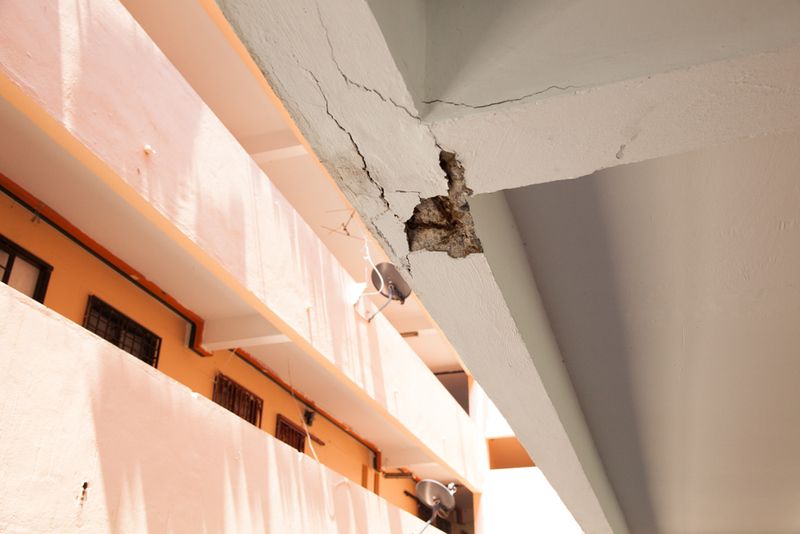 Abdul Rahman said his officers had gone down to Taman Permata a few days after the incident of the crack in the pillar, and had offered the residents there temporary accommodation in a Projek Perumahan Rakyat (PPR) in Bukit Jalil until things were settled. “However, they flatly refused my offer, and said they would stay in the tents. They gave excuses like Bukit Jalil was too far, they preferred to be near their workplaces and so forth. We asked them to be reasonable. Even if we were to build them terrace houses, it will take at least two years. Are they going to live in the tents all that time? Bukit Jalil is the nearest place we have for them,” Abdul Rahman said. Abdul Rahman confirmed his Ministry had received the earlier offer of 18 acres for settlement, and had indeed dismissed it due to the land being unsuitable. However, he claimed he had not received any follow-up on alternative settlement from them after this. He added that it was not a big issue to supply housing to the Taman Permata residents. However, they could not proceed until they had received the follow-up from the state government, as well as a letter of consent from the Taman Permata residents. Abdul Rahman said that should the residents of Taman Permata be relocated, they would have to determine issues of eligibility. He added that some residents had told him they were happy with the area, and had bought houses in Dengkil, which would bring up further problems of compensation. When the tour is done, we are brought back to the tent. Beside me, Thanapakian is preparing food. I ask her if she finds it difficult, helping to cook for a lot of the people gathered here, and she shakes her head. The residents of Block E tell me that they are not alone in their protest. Apparently, residents from other flats have come and joined them as well, in a show of solidarity. These families have stuck together for fourteen years now, united by common purpose. While it would have been easy to give up hope, they remain steadfast and resolute, determined to get what has been promised to them for so long. “These flats are not good to live in. We want our terrace houses,” Mathavi said. Hopefully, they will not have to wait another fourteen years. Editor’s note: State executive councillor V. Ganabatirau recently reaffirmed that 30 acres of state land will be allocated to build 400 houses. 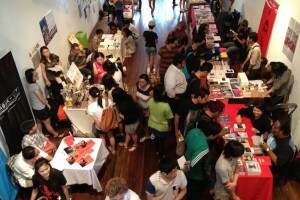 As of 12 August, the residents had not yet received a confirmation letter. At time of publication, the residents of Block E had been camping in a tent for 64 days.